This Newbery Medal winning novel is a triumph. Imagine a town nestled just on the edge of a forest. The town is frequently enveloped in a persistent fog. The forest is dangerous and said to be haunted by a witch. Every year the Elders of that town come to collect the youngest child born that year to bring into the forest as tribute and sacrifice to the evil witch who lives in the dark and dangerous forest. Those Elders know there is no witch, but the sacrifices serve to keep the townspeople in line. What the Elders don't know is there is a witch who lives in the forest. Her name is Xan and even though she doesn't understand why the townspeople abandon a child in the forest on the same day every year, she rescues that child and finds a safe and loving home somewhere the infant won't be found. This is background, these are the broadest strokes Kelly Barnhill uses to shape the world of The Girl Who Drank the Moon. This is how she sets up the story of Luna, one of the sacrifices rescued by Xan, but because Luna is imbued with an abundance of magic, Xan chooses to raise Luna herself. Xan doesn't raise Luna alone, though. There is a kind Swamp Monster named Glerk who may be far more than appearances suggest. There is also a Perfectly Tiny Dragon named Fyrian. Fyrian is a charming dragon who is small enough to fit in one's pocket, but somehow thinks he is a Simply Enormous Dragon living in a land of giants because nobody would ever lie to him. Fyrian is destined to enter the canon of the great dragons of literature. 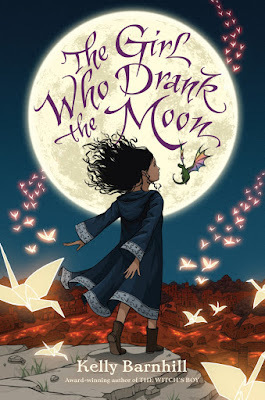 There is so much to love in The Girl Who Drank the Moon, but Fyrian is a remarkable creation filled with charm, humor, grace, wonder, and delight. The Girl Who Drank the Moon swept me away with charm and heartbreak and love and loss and oppression and the courage to stand up against it. Kelly Barnhill has a lot to say about institutional evil and the power in being a single voice standing up against it (and that how a series of single voices can become a chorus, though the analogy doesn't stretch much farther than that). She's just telling it through a framework of magic and wonder and the framework of a story we're pretty sure we've read before realizing we haven't read anything quite like this. Have I mentioned the Fyrian, the Perfectly Tiny Dragon? On January 23, The Girl Who Drank the Moon was awarded the Newbery Medal, the most prestigious award given for children's literature. Receiving the Newbery has nothing to do with my commentary on the novel, but it was something I wanted to note here. It's a significant award. It's a big deal. Bonuses: +1 for Fyrian. Fyrian is everything.